Update: Winners announced. Click the link to read the winning entry. The contest is now closed. A new edition will debut Friday morning. Disneyland . . . Congress . . . What’s the difference? 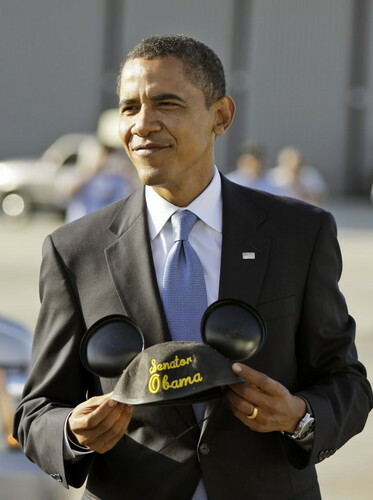 Senator Obama proudly displays his new (and smaller) ears. See, my ears used to be much smaller. There’s not a lot between these ears. Senator Obama graduates from dunce cap to mouse ears. My vision? A magic kingdom where everyone wishes upon a star. Oh, and I’m the star. I will spread the wealth around… beginning with the pensions of all Disney execs. And thanks for the hat, guys! As his ears get smaller, his nose gets longer! What’s the difference between a rat and a mouse? Marketing. Nice work, Karl Rove, but I can see this is just a cleverly altered yarmulke! Obamalot: Richard Gere told me that, if I wore this hat and a tail, he would get a warm tingle up his leg, and I might get beyond. I will not wear it. It’s supposed to say “President Obama”. Senator Obama insisted that while he did sit down with Mickey Mouse without preconditions, there were preparations before the meeting. Maybe this stupid hat will distract them from..oops..oh man, I got to break wind. Joe Biden – “Oh, God love you. What am I talking about ? You already took the mouse ears off”. all of you need these so you cannot hear the republican lies from mccain. and you will continue to wear these so my secret acorn ayers wright propaganda will be heard by all of you.and get off the internet. You are now under my secret power…. After a long and difficult search, Barack finally found something he was qualified to do. Who you callin’ a black rat! Mickey Mouse… don’t be ridiculous- don’t they know that I am really Topogigio and George Soros is my puppet master. Sorry kids, I tried to give up the habit, but I still smoke a mouse or two a day.